The dream of finding worlds beyond our solar system is now a reality. In 1992, Alex Wolszczan and Dale Frail announced the landmark discovery of planets orbiting a distant pulsar. Three years later, Michel Mayor and Didier Queloz ended the long quest to detect a planet around a star like our own sun. The pace of discovery since then has been astounding -- heralding nearly a dozen new alien worlds. Now you can join the planet hunt by locating some of the brighter stars with known planetary systems on a map of the sky. If conditions are right, you might even spot the actual stars in the night sky. Even with the most advanced telescopes, astronomers cannot image the planets beyond our solar system directly. They see evidence for their existence in the wobble of stars pulled by their gravity. The movement is so subtle that it's difficult to detect visually. So, some astronomers look for periodic shifts in the frequency of a star's light -- using a technique called Doppler spectroscopy. Other scientists listen to distant pulsars for the telltale sign of an irregular beat. The planets themselves may be impossible to see, but you can locate some of the stars at the heart of planetary systems. Knowing star names can point you in the right direction, because the name of a star often refers to its location within a constellation. 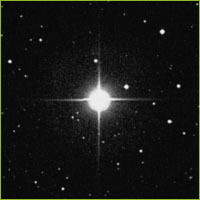 For instance, 51 Pegasi, the first sun-like star to be found with an orbiting planet, lies in the constellation Pegasus. Whether or not a star can be spotted easily in the night sky depends on its apparent brightness, or magnitude. Magnitude is signified by a numerical value, and the dimmer the star, the higher the number. The brightest star in the sky, Sirius, has a magnitude of -1.5, while stars with magnitudes higher than about 4 are difficult or impossible to perceive with the naked eye. The stars listed below are just at the border of visibility with the naked eye. With our limited vision, we can locate their approximate place in the sky, using constellations to guide the way. But to clearly pinpoint these stars, you may need binoculars or a small telescope. This star, 78 light years away, lies on the border of the constellation Virgo. In January of 1996, Geoff Marcy and Paul Butler announced their discovery of a massive planet -- over six times the size of Jupiter -- orbiting 70 Virginis. The planet's surface temperature is estimated at 85 degrees Celsius, well within the range for liquid water. But the massive planet is likely a lifeless gas giant. If this alien world has moons, they may be more hospitable to life. See where Virgo lies on the Star Map. Lying near the Big Dipper in the constellation Ursa Major, this star may be the easiest for amateur sky watchers to locate. Announced at the same time as 70 Virginis, its orbiting planet is a third the size and, with a surface temperature of -80 degrees Celsius, considerably cooler. The planet lies roughly twice as far from its parent star as the Earth does from the sun. See where Ursa Major lies on the Star Map. When Mayor and Queloz first described the planet they had discovered around 51 Pegasi, many astronomers were stunned. It raced around its parent star in a 4.2 day orbit -- putting it 500 times closer to its star than the Earth is to the sun. This broiling world challenged previous notions of where a Jupiter-sized planet would be found. Pegasus, marked by its distinctive Great Square, is known as an autumn constellation. See where Pegasus lies on the Star Map. Geoff Marcy and Paul Butler were among the scientists surprised by 51 Pegasi. 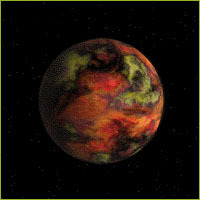 But in April of 1996, they found another massive planet orbiting close to its sun. The planet around 55 Cancri orbits every 14.76 days -- far more quickly than our own speedy Mercury. See where Cancer lies on the Star Map. Photo (1) copyright © John Whatmough, JTW Inc; (3) copyright © STScI/NASA. Visualization (2) produced by the Cornell Theory Center based on research by Alex Wolszczan, Penn State. Sky charts adapted from John Whatmough, JTW Inc.